for a factual scenario ». No one understood better the importance of our research for the origins of Philip Long than Helmut Klingelhöfer, archivist, from the Marburg Archives in Germany when he looked at my blog. He knew right then that I needed professional help. Moreover, he understood the seriousness of my hypothesis and the pressing need to put it to the ultimate test. 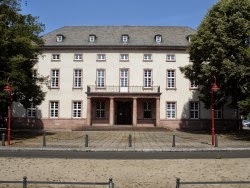 He referred me to Dr. Thomas Heldt, a professional historian and genealogist in Marburg. Genealogy is somewhat about the « prediction » of the past using whatever documents available. It’s about connecting dots in a particular way so that it shows a recognizable pattern, a continuous flow between the events in the life of an individual or family. So, in either direction, we are walking on thin ice. What lead me to believe that Philipp Lange, the Waldeck soldier during the American Revolutionary War (ARW), could very well be my ancestor? I have dealt with this matter in previous sections of my blog. Let me summarize my main reasons that have evolved a bit from my latest readings. 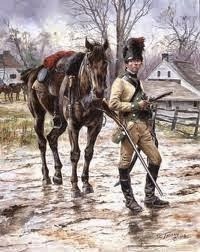 (1) Philip Long was a member of the King’s American Regiment from 1781 to 1783. So, he could have been a soldier between 1776 and 1781. (2) Philip Long said that he was part of the ARW from 1775 to 1783. (3) No one yet has been able to find a birth certificate for someone with a name close to Philip Long and who could have been a soldier in the ARW. (4) Many German mercenaries deserted their regiment and enlisted in a Provincial Company (British). (5) Many of those deserters to a Provincial Company received land grants from various Canadian governmental authorities in 1783. (6) Some German mercenaries with the family name of LANGE (but not all of them) changed their name to LONG after the ARW. (7) I assume that Philipp Lange, once he had deserted from the Waldeck Regiment in 1778, enlisted soon after in a Provincial Company and was part of the « Big Runaway » from the North down to the South a few months afterwards. 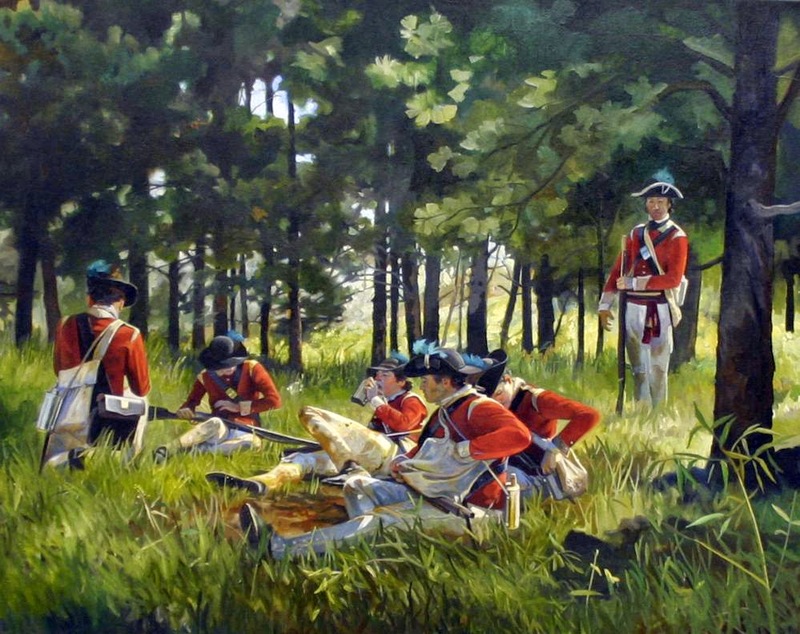 That would explain why a Philip Long was part of the West Florida Royal Foresters in 1781. (8) My readings on the subject of desertion lead me to conclude that desertion during the ARW came in all sizes and shapes. The reading of those primary documents changed my perception of the ARW itself. And my readings about the life of the German mercenaries were just as convincing. Desertion slowly came up as a key concept in the understanding of Philip Long’s life during the ARW. In fact, he mentioned in a letter the detrimental impact that the ARW had on his lifestyle afterwards. It is not surprising that they were all expecting a form of compensation, because they had all suffered. (9) I strongly believed that Philipp « deserted » from one company to the next, not because he was fleeing from danger or whatever reason, but because he was a dragoon, a cavalry soldier, and that these soldiers were better paid and in great demand during the ARW. So, I assume that he went from one offer to a better one. The fact that he was a cavalry soldier for three years could explain why he stole a mail bag from the Continentals only to bring it « to the British » as it was written. (10) He was not recognized as a British subject (British Isles) by a Scottish journalist who met him at Lac Témiscouata long after the ARW, a journalist who was more than happy and relieved to meet English-speaking travelers a few days before. Philip identified himself as an American Loyalist, not as an American. (11) Philip did not stay in New Brunswick after his arrival in 1783: he chose to rather integrate a French-Canadian society. He married a French-Canadian girl and became a courier interacting with French-speaking employees and customers.. It seems that the language barrier was not an obstacle. In fact, his own company captain, Captain Alberti, wrote his muster rolls in French. As a German soldier, it is possible that Philipp Lange had a certain understanding of the French language. (12) Jean-Pierre Wilhelmy has demonstrated that German mercenaries who deserted and chose to live in Quebec went to quite a length to erase their German roots. Many of them adopted French-Canadian surnames and refused to teach their children the German language. It is clear that I will try to get more information on that matter from Claude Crégheur considered as another of the few experts on the matter of German mercenaries who stayed in Quebec after 1783. (13) The birth date of Philipp Lange is very close to what is indicated in Dean & Kavanagh’s reports while Philip lived in Clair NB. In the 1830 US Census of Penobscot County, Maine, Philip is said to be between 80 and 90 years old: he would have been 77 or 78. We don’t know if he knew his exact birthday, if it was him that gave the information to the censors, nor if his family knew about his birthday. He would have been 67 when his last child, Michel, was born. Surprisingly, the priest made an 11-year error on his wife death certificate while she was living with family members. It doesn’t mean, though, that the censors made this kind of error in 1830. I don’t see any connection between these two events. The real questions are: did Philip knew about his birthday and was his family aware of it in 1830? Before going to Dr. Heldt’s report, lets talk about probabilities in a peculiar way. One day, watching a hockey game involving the Toronto Maple Leafs, you discover a player with a different name and he is unknown to you, Al Dubre. Your research turns up the following result. He’s been playing in the NHL for three years. But, you cannot find any trace of him in the small leagues years before. The first year, he played with Tampa Bay. But, where does he come from? You simply don’t pop up in the NHL without leaving traces in the smaller leagues and teams. Finally, you discover that Tampa Bay had signed two Russian players a few years back. One of them went by the name of Alexander Dubrevinski. What is the probability that Al Dubre is Alexander Dubrevinski compare to a few other ordinary citizens in the USA by the name of Alex Dupre, Alexander Dubrov and even by the same name, but never played hockey? Let me describe to you various parts of Dr. Heldt last report received on the 22nd of January 2015. «…Sadly the two baptism entries of Johann Henrich and Johann Philipp Lange are missing in the church records (I have checked the relevant years from 1750-1755 twice!). This could be the consequence of an inaccurate record keeping of the church records. It indicates that the Adorf church records are not complete concerning their entries. This is not only an Adorf phenomenon. I recognized it also in the church records of many other parishes. The Adorf parish is very large and some of the entries in the church records seemed to be made in great hurry, because the handwriting is very bad with tiny letters. Maybe the parson made his entries in the church records with the help of small notepads, which he made on the day and the place of the baptism, marriage or burial. If one of these papers was lost, there was no entry. Another reason could be the age of the parson. If we would have the time to compare the entries in the confirmation records of the Adorf church records with the baptism entries, we would possibly find many people who are in the confirmation records but are missing in the baptisms. About the origin of the father Johann Paul Lange we have two different notices in the church records. At his marriage, it is said that he was from Buchenberg which lies about 16 kilometers south of Korbach near Kirchlotheim. In 1756, it is mentioned, that he was from Rühle. Rühle is a small village on the banks of the river Weser, about 5 kilometers south of Bodenwerder (the home town of the famous Baron von Münchhausen). To be certain about his origin, further research will be necessary. I have made an attempt to find his own and his wife’s death entries, but without success. Because of the tiny handwriting, you sometimes need a magnifying glass to see what was written. But, I am very sure that both died in Wirmighausen. That his parents still lived in Wirmighausen might have been one reason for Johann Henrich Lange, to go back to this tiny village after his adventures. The mother of Henrich and Philipp Lange was named Maria Margaretha Figge. Figge is a very common name in this part of Waldeck. So, she was from an old-established family, whereas her husband was a foreigner. In her marriage record she is mistakenly called Maria Magdalena after her sister, who was godmother in 1747. Her first marriage took place in Wirmighausen in 1741 with Henrich Backhaus from Rhenegge who died 2 months after the marriage. As a widow, she married Johann Paul Lange. I have found the confirmation of a Maria Margaretha Figge in Wirmighausen in 1730. If she is the right one, it could be verified with further research. The maternal ancestors of the Lange brothers could be easily found in the Adorf church records back till 1648. The couple Johann Paul Lange and Maria Margaretha Figge lived from 1743 till, at least, 1766 in Wirmighausen. 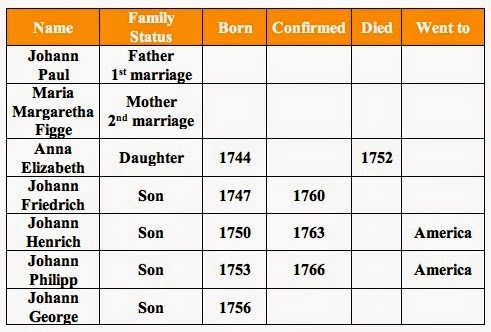 Because of the gap between the baptisms of their children between 1749 and 1756, there could be the possibility that the couple lived in another village. The fact that their first daughter Anna Elisabeth died in Wirmighausen in 1752 is a proof that they definitely lived in Wirmighausen during that time. This verifies, that Johann Henrich Lange * 1750 and Johann Philipp Lange * 1753 were definitely born in Wirmighausen. In all the muster rolls, which I could find in the Marburg state archive, Wirmighausen is the mentioned birthplace for both! However, the given ages are wrong in the muster rolls. That the Lange couple had no easy stand in Wirmighausen, because Johann Paul Lange was not born there, reveals the fact that he was never godfather in Wirmighausen between 1743 and 1760 (the years, that I have checked in the baptism records). Therefore, one can suppose that he was to a certain degree an outsider. Even his sons Henrich and Philipp Lange are not mentioned in the baptism records from 1769 till 1776 as godfathers! As I have said before Johann Friedrich Möhle was a Waldeck soldier as early as 1749 and lived in Wirmighausen. I am very sure, that he made the contact or interested both Lange brothers to join the Waldeck military service. Since my next step should be to find descendants from Henrich Lange, his findings give me some hope. But, did Henrich have a son? When Dr. Heldt says that Johann Paul was an outsider to Wirmighausen, it doesn’t mean that he came from another country. Apples fall close to their tree. At that period, there were Langes all over Germany and in adjacent countries. It doesn’t mean, though that they are all related. Our own recent experience with DNA testing proves that over 300 Longs belong not to one , but to many unrelated haplo groups. A DNA test is very efficient within a well-defined genealogy. The problem is that those with such a well-defined genealogy don’t get a DNA test. Why would they? Moreover, a DNA relation between two individuals with the same surname does not prove that they share a recent ancestor. This sharing could go back many centuries. Consequently, we are not close yet to pinpoint a potential DNA candidate in Germany. But, there is some hope. My documentation lead me to believe that Henrich Lange was Philipp’s brother and that he went back to Germany after the ARW. The research of Dr. Heldt confirmed my suspicion. « After the extensive campaign of the 3rd Waldeck regiment in North America Henrich Lange came back to Wirmighausen, to found a family. He married the daughter of the soldier in the Waldeck regiment Johann Friedrich Moehle (Waldeck soldier and inhabitant of Wirmighausen in 1749). If he has ever heard of his brother Philipp Lange again, remains a mystery. »…..
…..« Therefore he was born in 1750! This fits perfectly with his confirmation record of 1763, when he was 13 years old. Remember that his elder brother Johann Friedrich was born in 1747 and was confirmed in 1760! Therefore the confirmation age in the Adorf parish, back then, was 13 years. NOTE. Henrich Lange is not, in any way, bringing Philipp Lange closer to Philip Long. Henrich and Philipp were both Waldeckers during the ARW. My interest for Henrich grew out of the hope that Henrich could be linked to Philip Long during or after the ARW. Up to now, I have not found any document that shows a relation between them (Henrich Lange and Philip Long, that is). All I have found is that Philipp and Henrich were brothers and soldiers in the same German regiment. Maybe this kind of proof will come from a most unexpected source…. In fact, Henrich didn’t desert: he was captured and he subsequently bought his freedom, a regular practice during the ARW. One of the most intriguing records in Philipp’s military file is the one dated 18.9.1778. I already knew that he had deserted in August 1778. I was hoping to learn something more about this second record after his desertion. It turned out to be empty. I’ll live with that! « In this record there are reports (Rapporte) from 1777-1783, but the report from 18.9.1778 concerning Philipp Lange is missing. »…. ….« Therefore the information in the report (on page 69), we were in search for, was part of the „Rapport“, which was made on Staten Island on September 18th 1778. As a consequence Philipp Lange must have deserted form the camp on Staten Island maybe to NY and from there to Canada. Dr. Heldt found a note that says that a muster roll existed early in 1776, but is not stored at Marburg. He’s right. From 1776 to 1778, two muster rolls exist at the PRO in Kew, England. I got a copy of two of them from the David Library in Pennsylvania. These muster rolls prove that Philip was never made POW. Philipp does not show up in the subsequent muster rolls because he deserted his regiment. (1) Even if you’re interested in reading the full report of Dr. Heldt, I can send it to you. His report is written in German and in English. Only this aspect of it is worth the effort of reading it! (2) I’m trying to go from 99% to 100% certainty about my ancestor’s origins. I want you to know that I’ve known from the very beginning that an ocean separates those two values. I have to believe strongly in my hypothesis simply because, at 10% assurance, it won’t be enough to motivate me. At 100%, I will quit. So, I prefer to bring myself at one arm’s length to my goal: seeing is believing! (3) Seriously, I know that I am working for a whole family, and I’m trying to be a devoted employee, that’s all. (4) Many of you will keep hanging to deep interrogations about my research, my findings and the connections that I’m making between the dots….. That alone keeps me alert and going strong. It shows, also, a strong interest on your part along the way. (5) After this firm report of Dr. Heldt, don’t think that I’m celebrating. No: I’m sweating! (6) His report brings us closer to the next step: find a DNA candidate in the area of Wirmighausen. (7) We haven’t been able to find a sample of Philipp Lange’s signature. I have studied, though, dozens of German signatures in Pennsylvania during the time of the ARW. It sure is surprising to see their similarity to Philip Long’s signature. But, that might be simply coincidental. From Philipp’s signature, it seems that he didn’t go to school very long. (8) One thing is sure: my confidence hasn’t fall down to 98% !!! frankly, there are so many dates and places of birth in those trees that a cat would loose his kittens! There is nothing wrong about ignoring an answer. This is a research, not a contest! way ahead of what I was expecting. Kaufholtz-Couture, Claude, & Crégheur, Claude. Dictionnaire des souches allemandes et scandinaves au Québec. Les Éditions Septentrion. ISBN 9782894487310. 552 pages. Krebs, Daniel (1974). A Generous and Merciful Enemy. 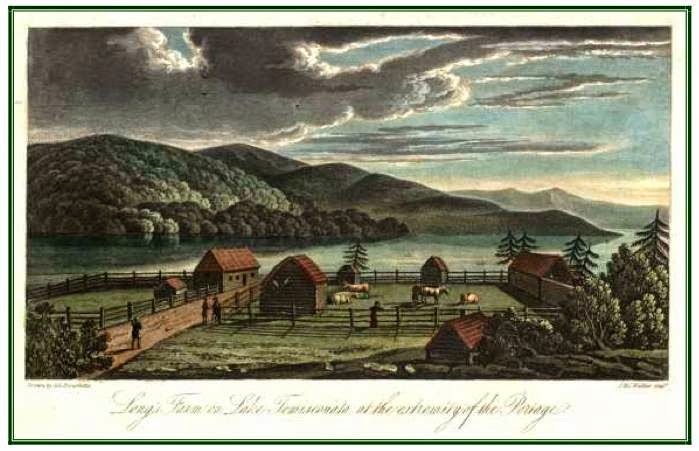 Life for German Prisoners of War during the American Revolution. Campaigns & Commanders. Gregory J. W. Urwin. Series Editor. University of Oklahoma Press. Wilhelmy, Jean-Pierre. Wiki. En plus de nombreuses autres publications qu’on trouve aisément sur Internet.